Mina and Adriana are Caroline's ladies and her best friends. They've been with her since the age of fourteen had have influenced Caroline's behavior in a very positive way, allowing her to turn her actions around. Mina and Adriana are fiercely loyal to Caroline. My choice for this duo are Natalie Portman and Keira Knightly (after my Paris & Nicole drama! Hahaha!) Natalie has the exotic looks and the ability to take into a lot of compassion, which is needed for the character. Same for Keira. Natalie and Keira have also teamed up before in Star Wars I. 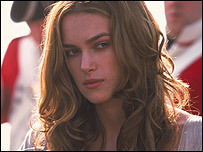 When Natalie's character, "Padme," went to Tatooine, it was Keira who posed as the queen. They're around the same age and both are fabulous actresses.